Meeting a Studio Ghibli fan in the West is a lot like meeting a teenage fan of John Lennon who has never heard of The Beatles. You listen to him rave about how much he loves Imagine, but when he describes it as “Lennon’s First Album,” you stop and look puzzled. You almost feel sorry for the poor kid who’s completely missed out. So let us start, briefly, at the beginning. In 1965, Japan’s premier animation studio, Toei Doga, was busy producing their eighth feature film, Gulliver’s Space Travels. It was their first movie created with an international audience in mind, drawing inspiration of Jonathan Swift’s Gulliver's Travels books. Toei President Hiroshi Okawa founded the animation studio in 1956 with the dream of becoming “the Walt Disney of Japan,” sharing his nation’s rich cultural heritage with the rest of the world, and showcasing the innovative talents of his animators. These animators had studied the pioneers of Western animation, from Disney to Fleischer and all points in between, but they were slowly developing new ideas for animation theory, encouraging all staff members, regardless of status, to suggest story ideas. One young man jumped at the opportunity, an in-between animator who was hired two years prior and trained by the studio’s teachers. Despite his entry-level position, the young animator was bursting at the seams with energy and ideas, and he had a bold idea: he wanted to change the ending to the movie. Gulliver’s Space Travels is an outer-space adventure about a young boy named Ted who joins up with a grandfatherly Gulliver for an adventure to the stars. They discover an alien world where a race of robotic puppets are oppressed by a sinister race of evil robots from an adjacent world. Armed with a water pistol and an assortment of cartoon friends, Ted and Gulliver rescue the puppet princess, defeat the invading machines and bring peace to the realm. This rookie animator had a novel idea: Instead of merely rescuing the world of puppets, what would happen if the princess, and all her people, were not puppets at all, but humans trapped inside by their robot overlords? When the princess is rescued, her shell could be cracked open with water, revealing a young human girl inside. 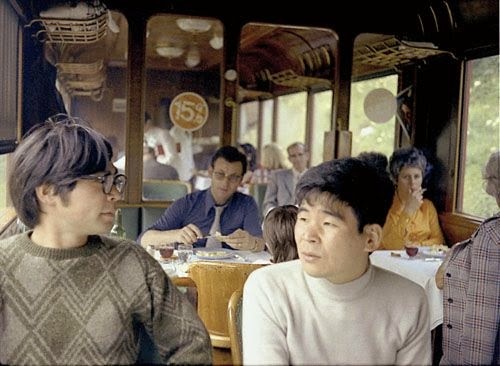 The young man’s name, of course, was Hayao Miyazaki. The studio, and his peers, quickly took notice of his talents, and he soon rose to key animation, first with television, later on the classic Toei features Puss in Boots, Animal Treasure Island (a Miyazaki film in all but name) and Ali Baba & the 40 Thieves. All that was needed was a partner to whom he could bounce his endless ideas. He found that partner in another young man everybody cheerfully called Paku-san. Isao Takahata was gifted with a prodigious mind: precise, logical, widely curious. He was courted by Toei Doga while still a university student, and joined the movie studio in 1959 as part of the director’s department. I have never understood fully why Takahata chose animation as his muse. He could have easily made a career as a live-action director, having worked on two of Toei’s live-action television series during his assistant director’s internship. He was clearly inspired by documentary film, the Italian Neorealists, the French New Wave. He cites the French animator Paul Grimault as a primary influence on his work and ideas. Perhaps he sought a greater challenge. His grand vision required nothing less than a transformation of the medium itself: a fusion of hand-drawn animation with live-action sensibilities. Such a thing had never existed before. Takahata won the respect of the Toei bosses and quickly rose through the ranks. He earned his first directing role on Wolf Boy Ken, Toei Doga’s first television cartoon series (a direct response to Osamu Tezuka and Mushi Productions’ Tetsuwan Atom, aka “Astro Boy”), and also directed the opening title sequence for Hustle Punch. In 1965, after the completion of Gulliver’s Space Travels, animator Yasuo Otsuka was named the animation director for Toei’s next feature animated film. Otsuka agreed on one condition: that his friend Paku-san would direct the picture. The studio agreed, the die was cast. Takahata immediately set to work. As the president of the Toei animators union, he had built friendships with many notable talents, including Yasuo Otsuka, Yasuji Mori, Yoichi Kotabe, Reiko Okuyama, and Hayao Miyazaki. Paku-san revealed his master plan: to create a feature animated film that would inspire the rising youth generation, address the political and social themes of the times, and carry the banner for the union’s values of democratic socialism. And they would create a thrilling spectacle never before seen in Japan. Perhaps we are being romantic. Perhaps Paku-san didn’t seek to spark a revolution. He certainly never wished to wage war against his studio bosses. But revolution was at hand, for the studio and Japanese animation. And the war came. The movie we refer to, of course, is The Great Adventure of Horus, Prince of the Sun. It is famous for its long and turbulent production, which lasted over two-and-one-half years, consumed over twice its original budget, and used 150,000 animation cels, an astonishing number for Japanese animation (that record would finally be broken by Katsuhiro Otomo’s 1988 landmark Akira). The original running time was cut by one-fourth. The original title was rejected by the studio for being too controversial (Takahata changed the name but secretly kept the story intact). Several child-friendly cartoon characters were imposed into the story. Two action sequences were never animated. The finished film was met with the worst box-office returns of any Toei Doga feature. In the aftermath, many staff members were demoted and reshuffled, including Isao Takahata, who was sent back to television to direct several children’s cartoon shows. As we all know, this story does not end here. Horus, Prince of the Sun emerged not as an embarrassing failure, but a groundbreaking masterpiece. It introduced the auteur theory of directing to Japanese animation, as well as complex characters, and adult situations. This movie introduced frame-rate modulation, richly complicated frame compositions, and a fully three-dimensional virtual “camera” that simulates specific lenses and shots. This movie fused psychological realism with an expressionist use of character and background art to show conflicted hearts and minds. This is the movie that liberated Japan from the Walt Disney archetype, creating a new and unique brand of animation known, simply, as anime. Most importantly, Horus marks the first real collaboration in the famed partnership between Isao Takahata and Hayao Miyazaki, one that would continue across five decades. Their director-animator partnership was one of teacher and student in the 1970s; this would grow into a producer-director partnership in the 1980s and 1990s. Eventually, the two filmmakers’ paths had diverged too far for collaborations, and they learned to respect one another’s space. But they have always maintained their friendship and mutual respect for one another. In 1971, Takahata and Miyazaki left Toei to join up with Yasuo Otsuka at A Productions studio, working as the “directors team” on another groundbreaking, ahead-of-its-time anime, Lupin the 3rd. This would be Miyazaki’s directorial debut, and many episode ideas would later be incorporated into his 1979 feature film, Lupin the 3rd: The Castle of Cagliostro (a movie which was a direct sequel to the original series). During this time, Takahata (director), Miyazaki (layout, design, ideas) and Yoichi Kotabe (animation director, character design) joined together to create an animated series based on Pippi Longstockings, a project which famously collapsed when author Astrid Lindgren refused to grant the rights. Many of the story and character ideas would find themselves incorporated into the joyous and endearing Panda Kopanda short films in 1972 and 1973. The trio then carefully crafted together another animated series, one that not only aired, but became a worldwide sensation, finally realizing Hiroshi Okawa’s vision of sharing Japanese animation with the world. It’s name, of course: Heidi, Girl of the Alps. Heidi spearheaded what would become known as World Masterpiece Theater, a beloved staple of Japanese television. The trio of Takahata-Miyazaki-Kotabe would return again in 1976 with 3000 Leagues in Search of Mother (aka Marco), a series that pushed animated character melodrama to its absolute limits. Its epic landscapes and large cast of characters, complete with interweaving storylines, and its wrenching emotional intensity, make Marco a masterpiece. But it lacks Heidi’s enthusiastic optimism, as Takahata exerted greater creative control. The strains eventually caused the band to break up. Interestingly, at this time, Miyazaki began character sketches and story ideas for a lighthearted children's tale featuring three large woodland animals who make friends with a young girl. The story would eventually be made into the Studio Ghibli feature My Neighbor Totoro. By 1978, Hayao Miyazaki was ready to fly solo, and the result is one of his most enduring classics: Future Boy Conan. A continuation of the cliffhanger-serial adventure comic style of Puss in Boots and Animal Treasure Island, Conan is thrilling, tense, endlessly funny. It shows a great maturation from his early period, both in the story pacing and its themes. The series aired on Japan’s NHK network, beginning a partnership with the director that continues to this day. 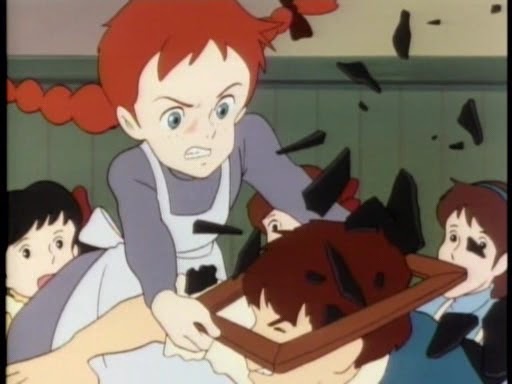 In 1979, Takahata persuaded Miyazaki to return for Anne of Green Gables, the third in their WMT trilogy. Young animator Yoshifumi Kondo, who began his career on the 1971 Lupin series, replaced Kotabe as animation director. The series is a masterful rendition of Maud Montgomery’s classic book, utilizing Takahata’s trademark neorealism and psychological fantasy, with a heavy dose of romanticism. After thirteen episodes, Miyazaki bowed out after being given the opportunity to direct an animated feature film, The Castle of Cagliostro. As with Conan, Yasuo Otsuka served as animation director, and this movie played like a summation of the decade, with obvious influences and riffs from Lupin ‘71, Heidi and Conan. It’s a terrific caper movie, perfectly lean and trim and without a dull moment. It also carries a weary mood, portraying a hero who feels trapped in his life of endless adventures. La Dolce Vita comes to mind. This mood becomes eerily prophetic as well; Cagliostro, like Future Boy Conan, was not a commercial success, and thus began a long and difficult period for Hayao Miyazaki, which includes the second Lupin television series, the Sherlock Hound series (which was famously scuttled after only six episodes were completed), and the US/Japan Nemo film production. By 1983, the director’s career appeared all but dead, and so he retreated to his first love: Japanese manga comics. Specifically, a weekly serial in Animage Magazine called...Nausicaa of the Valley of Wind. Takahata, meanwhile, proved far more stable during this period of 1977-83. In 1981, he directed the masterful family comedy Jarinko Chie, with Otsuka and Kotabe both serving as animation directors. The movie no doubt inspired My Neighbors the Yamadas with its episodic structure and family drama, but Chie is more tightly focused, and is also a love letter to the city of Kobe. 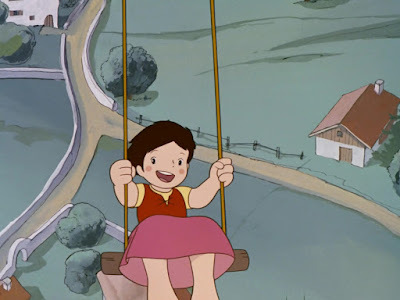 The success of the film led to a TV series, where Takahata served as “general director,” which means he oversaw the production and guided the series, but did not direct any specific episodes. In 1982, Gauche the Cellist was released by the Oh Productions studio, after a long six-year gestation as a labor of love. It’s a masterful, sweet, sparse film, one that fuses the music of Beethoven’s Pastorale to the poems of Japanese poet Kenji Miyazawa. The entire movie is the work of three men: Takahata, Shunji Saida (animation director, key animation) and Kenji Matsumoto (background art). Another trio. Another fusion of the arts. Another emotionally overwhelming masterpiece. Hayao Miyazaki is a dynamic, emotional character, and I think that’s why I enjoy his films so much. His turbulence is part of what makes him such a compelling storyteller. You’re caught up in the whirlwind of his life and ideals and passions, largely because that drama fuels his personal storytelling style. He is the youthful idealist who becomes the disappointed cynic; the young Horus who grows into Porco Rosso. He’s the young comics artist who learns to ask deep, probing questions. He’s the escapist who seeks complex meaning. And he’s always wearing his heart on his sleeve. Paku-san, meanwhile, is always rock-steady, “walking logic,” as Mamoru Oshii once described. He has met many hardships, particularly his early years, but we weathers them calmly. You can appreciate his patience in creating, for example, The Tale of Princess Kaguya, when you understand just how difficult it was to create Horus, or Heidi, Marco and Anne. True, he has strained the patience of many a producer with his deliberate, measured pace, his willingness to break budgets and schedules. But look at the results. Look at all the masterpieces. If you are only familiar with the films of Studio Ghibli, then I am happy to report that you have missed half the symphony. An entire first half awaits your discovery, one whose works completely define and influence the second. Discovering each film forces you to reexamine the later ones in a new light, draw out new ideas or themes, illuminate new facets to the stories. Go watch Horus and Animal Treasure Island. Go watch Lupin and Conan. Go watch Heidi, Marco, Anne. Studio Ghibli is a link in a long chain, one that extends back to Oh Pro, Telecom, Nippon Animation, A Pro, and finally Toei Doga. It’s all part of a long conversation full of humor and tragedy and depths of meaning. What does Imagine mean to you after you’ve finally discovered Rubber Soul? A lot. Welcome to Pepperland, Ringo. Glad you could join us. Congrats for this beautiful blog! I just discovered it and I'm excited to share all these interesting posts about Studio Ghibli in Ghibli communities! ps: actually it just dawned on me, I have been reading your blog a lot in the past! It was a bit different then, so I got a bit confused... Great blog!